So no argument as per usual. 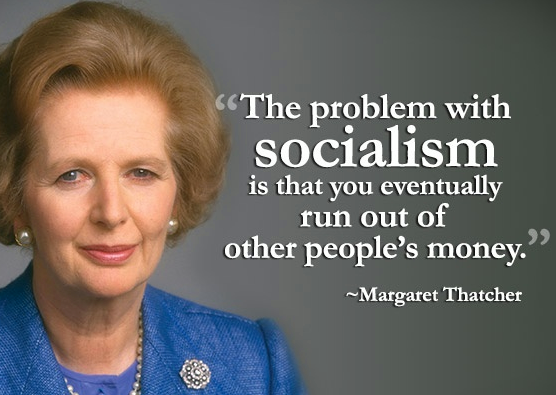 Just a primitive appeal to populism via the spamming of memes containing cherry-picked quotes from three people, one of which is frequently described as "the most evil woman in British history" (Thatcher), while Rand is described by the Psychology Today journal as a failed philosopher. You lack both the intelligence to construct a viable argument and the honesty to balance information accurately. It is little wonder then that you are a populist, since populism was always designed to capture the imagination (and votes) of stupid people with massive egos and big mouths who were subliminally bitter about their own human failures, which populism gave them opportunity to subsequently project onto other people. Ad hominem. The point is still correct. while Rand is described by the Psychology Today journal as a failed philosopher. That's how the left discredits anyone who disagrees with them. We get that. 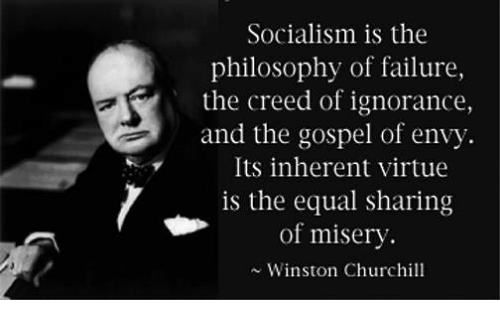 So no comment on Churchill. Using your Thatcher point, he is correct because he's "not the most evil person of all time". Balancing context is not ad hominem. Cherry-picking quotes from dead right wingers with the specific intent of attacking socialism is ad hominem. As per usual, you accuse everyone else of what you yourself are guilty of. The point is still correct. You have no point and, even if you did, the odds would be astronomically low of it being correct. Spamming three right wing memes containing cherry-picked quotes from dead celebrities you wish to use to make an appeal to authority is not a point. It's more of the same retarded alt-Reich propaganda you infect this site with on a daily basis. People do not work in socialism and having the government telling everyone what to do is not the answer but neither is having billionaires running everything. 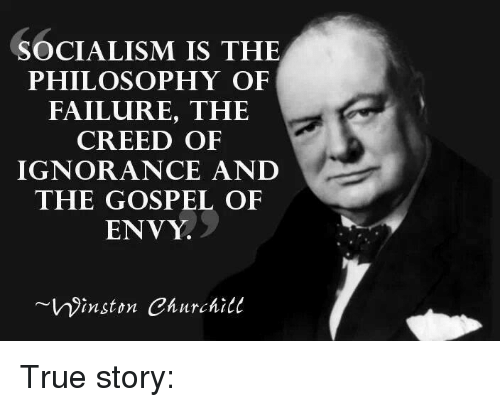 Churchill made a very common mistake and confused state capitalism (i.e. where the government controls everything) with socialism (i.e. where the working class control everything as the majority). Whenever anybody says anything which refutes any of your dumb comments, you claim they are "the left" and then use that as a reason to ignore them. It's stupid. I mean, it's really, really stupid. Psychology Today and the political left are very clearly two different things. You ignored Winston Vhurchill now twice. Why would you do that? I'm done now Bronto. You don't have the intelligence to have a reasonable discussion. You are simply going to continue telling lies and downvoting every attempt I make to reason with you. You are pathetic, buddy. A real failure. You've been on the site for over 12 straight hours. Tell us more about that. Is this the list of your alts? Why would we care about a list of your alts? Why would we care about a list of your alts? Why do your own children hate you? We'll never know why your own children hate you other than your sperm didn't do a good job. They must have swum crookedly. I just looked at your points total. Yet another puppet account. What a sad little man. So sad. This is what your life has amounted to. Obsessive compulsive disorder and spamming neo-fascist diatribe on an internet site supposed to be here for debating. My children don't hate me because I don't have any children. You on the other hand admitted that you do have children and that they do not speak to you. Then you changed your story a few weeks later when people began to make jokes about it. To be fair though, who knows what is the truth? You tell so many lies that I doubt you even know what is true yourself. Get help Bronto. You obviously have problems with obsessive-compulsive disorder, narcissism and compulsive lying. That's what someone who ate their children would say.